A government simulation or political simulation is a game that attempts to simulate the government and politics of all or part of a nation. These games may include geopolitical situations (involving the formation and execution of foreign policy), the creation of domestic political policies, or the simulation of political campaigns. They differ from the genre of classical wargames due to their discouragement or abstraction of military or action elements. Games based on geopolitics and elections existed long before the emergence of personal computers and their ability to quickly process large amounts of statistical data. One of the earliest such games was The Game of Politics, created by Oswald Lord in 1935 which remained in print until 1960. In 1954, the board game Diplomacy was created, which differs from other wargames in that it features a "negotiation" phase during which players reach agreements with other players, and then execute military moves simultaneously. National politics has remained a vital area of board gaming, with products such as the 1986 board game Die Macher featuring elections in Germany, and Wreck the Nation which satirizes the politics of the United States under the Bush administration. NationStates is a website based simulation game that allows for the creation and customization of a "nation", allowing players to shape their nations policies via issues which the player receives on an adjustable basis. After enjoying years as a play-by-mail game, Diplomacy was one of the first games to move to take advantage of e-mail, and continued to be a popular email game into the 2000s. As computers became more sophisticated, games in this genre moved beyond e-mail to more complex simulations. For most users in Europe, the first well known politics game was Dictator [ru], released in 1983 by DK'Tronics and running on Sinclair's ZX Spectrum. One of the earliest titles in this genre was Balance of Power, designed by Chris Crawford and published in 1985. This game features conflict at the height of the Cold War, using political and policy decisions to shape outcomes rather than warfare. In Balance of Power, any armed conflict between the player and the opponent superpower results in a nuclear war, which is considered a loss condition. Other Cold War era games included Conflict: Middle East Political Simulator created by Virgin Interactive, Spectrum Holobyte's Crisis in the Kremlin and virtually unknown Hidden Agenda. Conflict simulated a hypothetical situation in 1997 in which the player assumes the role of the Israeli Prime Minister and is obligated to employ various diplomatic and covert directives to defeat its rival nations. Surrounded by hostile nations, the player is restrained by a very limited military force and thereby encouraged to employ peaceful means to remain in power until he acquired more advanced weapons systems and power. In Crisis in the Kremlin, the user could play as the protege of any of the following Soviet politicians: Mikhail Gorbachev of the reformist faction; Yegor Ligachev, leader of the hard-line faction; and Boris Yeltsin, who was the prevalent figure of the nationalist faction. The player could use the simulation to test certain strategies to lead the failing Soviet Union into a new era of prosperity or force its dissolution and integration into the new world order. This game introduced the concept of budget management, citizen and faction satisfaction as well as multiple economic values and political spectrum. In Hidden Agenda the user takes the role of the president of Chimerica, a post-revolutionary Central American country, trying to juggle international relations and the needs of the country's citizens. Virtonomics has a political simulation module where players can participate in election on three levels: city elections to become a mayor, government's election and president's election. Players-politicians can change taxes, custom dues, rent rates, transportation fees and regulate budget which affecting macroeconomics of the game world. Early political simulation games were intended more for education than entertainment. In 1987, On the Campaign Trail was developed as a tool at Kent State University's political campaign management program, and engaged students in decision-making regarding the campaigns for United States Senate elections between 1970 and 1986. Subsequently, a commercial market developed for packaged games involving elections and campaigns. Some games in the genre involve enacting policies and budget decisions to sway voters. One such game is Democracy, published in 2005 by Positech Games. In Democracy, players make decisions during each turn regarding which policies to support. As turns progress, the player views how their favourability rating changes amongst certain types of voters. Candidates make promises before each election, and failure to follow through can result in lower support during the player's re-election campaign. Another is the Geopolitical Simulator series, produced by Eversim, boasting an array of choices for domestic policy and decisions based around current geopolitical issues. Another such game is Tropico. There can also be found games that puts the player in the seat of a state leader, such as SuperPower, and its sequel, SuperPower 2, whose goals are to produce economic stability and prosperity, but the game mainly revolves around foreign policies, with the abilities to interact with other countries in many ways. The game includes a great number of real-life treaties that influence countries. Web-based games such as NationStates allow players to manage the day-to-day decisions of individual governments, and compete against rival nations. Less formally structured games are also played out in internet forums, where players manage governments and nations according to a set of agreed rules. These such forum-based simulation games - often known as "Polsims" - simulate the politics of one specific nation throughout rounds set in differing time periods. Not all "Polsims" take place on a national level. Some Polsims take place internationally, whereas others take place on the state or local levels. Players on such games play as fictional politicians and participate in debates, media activity, and simulated elections. Realism is highly stressed with key topics of the day often debated on and spun by the players and admins (who are able to shape the game world in any way that they choose). In other web based games players register, apply for an open position (either a country or person inside a country such as a politician or army general) and carry out game activities either through newspapers or other activities or (more commonly) through gamemasters. Realism and cooperation tend to be highly promoted in such games. 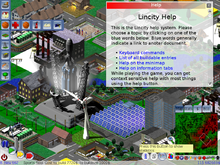 City-building games, such as Lincity, require the player to manage the governing features of a city. Other construction and management simulations require government management. For example, city-building games such as the SimCity series of games developed and published by Maxis simulates the experience of being a mayor. SimCity features a real-time environment in which the player can create zones for city development, build roads, power and water utilities, and watch as their city develops based on their decisions. The game was originally published in 1989 and as of 2013 was in its fifth major release. Strategy games frequently make use of government management challenges. 4X games require the management of a government, be it tribal or interstellar. This includes tasks such as building infrastructure and conducting trade. Galactic Civilizations II requires players to manage their approval rating to keep their political party in power. Domestic policy is sometimes abstracted with more emphasis on international conflict. For example, the Civilization series gives players total control over resources, and radically restructuring an empire is a matter of clicking a "revolution!" button. Other strategy games focus on government management to varying degrees. For instance, in the Hearts of Iron games (set in World War II) the civilian population is only a factor with partisans and manpower, whereas in Victoria a player must not only 'hobnob' and conquer, but implement the Second Industrial Revolution while warding off (ushering in) real political revolutions such as the upheavals of 1848 and communist revolt. Government and politics have also been incorporated into adventure games. A Mind Forever Voyaging, published by Infocom in 1985, was an interactive fiction game in which the player controlled a sentient computer capable of experimenting with potential future scenarios based on varying public policy decisions. Newsweek said of the game, "It isn't '1984,' but in some ways it is even scarier." The 2008 game Spore features a "Civilization" stage where the player controls vehicles and interacts with other cities until he or she has control of all 12 cities. ^ Tom Leupold (2004-08-12). "Spot On: Games get political". GameSpot. Archived from the original on March 13, 2007. Retrieved 2007-01-07. ^ Time Magazine, February 3, 1936, "Monopoly & Politics"
^ Allan B. Calhamer, Europa Express #10, "The Roots of Diplomacy"
^ Erik Arneson, "Playing Politics"
^ "BuzzFlash Reviews". Buzzflash.com. Retrieved 2011-01-17. ^ Jim Burgess, "Play-by-Mail Diplomacy vs Play-by-Email Diplomacy"
^ Zzap! Issue 70, February 1991, p.48, "Conflict: the Middle East Political Simulator"
^ Social Science Computer Review, Vol. 12, No. 3, 447-448 (1994), "Software Reviews: Crisis in the Kremlin"
^ "Virtonomics: Play to become a virtuoso entrepreneur". On Serious Games. 2015-08-20. Retrieved 2016-02-23. ^ "President Elect." Moby Games (retrieved on January 25th, 2009). ^ "IGN: The Doonesbury Election Game". Pc.ign.com. 1995-12-30. Retrieved 2011-01-17. ^ "Power Politics III (PC)". GameSpy. Archived from the original on February 5, 2008. Retrieved 2007-12-22. ^ Jason Silverman (2004-08-19). "Campaign Game Mimics Real Life". Wired. Archived from the original on September 18, 2008. Retrieved 2007-12-22. ^ Jess Nickelsen. "Democracy (PC)". NZGamer.com. Retrieved 2007-12-06. ^ "Positech Democracy". Retrieved 2007-12-06. ^ Jackson, Stephen (2018-04-04). "Best Political Games To Play On PC in 2018". Gaming Respawn. Retrieved 2019-01-12. ^ "NationStates - Walkthrough, Tips, Review". Jay is games. Retrieved 2019-01-12. ^ News, A. B. C. (2006-01-07). "A Web Site of Virtual Nations". ABC News. Retrieved 2019-01-12. ^ Tal Blevins (2003-01-14). "Sim City 4 Review". IGN. Retrieved 2007-12-22. ^ "Ad-Blurbs for A Mind Forever Voyaging". MobyGames. Retrieved 2007-12-22. ^ Dave Carey (2007-01-06). "Simulation games help prepare government, unite local businesses". The Washington Examiner. Archived from the original on 2012-07-20. Retrieved 2011-03-18. This page was last edited on 9 April 2019, at 22:05 (UTC).